Who can learn computer graphics? JOB-GUARANTY with our latest animation courses. 10th pass/fail students can apply!!!! He met my maths teacher, to make sure that I was not faking the marks in my progress card !!!!! are actually the outputs of some programs, written by somebody. So... I was wondering what kind of people can create the wonderful programs like the computer games. And I started asking the people around me to gather more information. 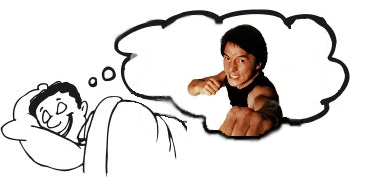 It was like watching Jackie Chan on the big screen and dreaming to become a kung-fu master like him. Q. Who creates the games? A. The computer graphics guys. Q. How do they create those computer graphics? A. They have some very biggg animation software. Q. But... Who creates those bigg software? Q. If I learn programming, can I too make such graphics stuff ?? A. ... ... ... Don't you have that maths homework ???? Go and finish it !!! NOW !!!! So... my "ADMIRATION" on those bigg animation software grew up even more, along with my curiousity as well as frustration. And I'm sure that there are more people in this world who are equally (or more) frustrated because of the missing link between "graphics" and "programming" in their academics. To bridge the gap between the programming taught in the academics and the programming required for the graphics is one of the main reasons to create this blog.